True to its cult following, Shu Uemura cleansing oils are time-honored for its famous and much sought after sacred daily cleansing oil. Never to rest still with the march of time, Shu Uemura unveils yet another ultimate pampering for makeup removal, facial cleansing and treatment with the launch of its new Ultime8 Cleansing Oil. Mr. Shu Uemura often said that he wanted to be a swordsmith, polishing iron repeatedly to create an excellent sword. He applied the same belief with the new Ultime8 Cleansing Oil – reaching the pinnacle of luxurious cleansing. For this, scientists at the Shu Uemura research centre have successfully combined science, nature and art to create its new Ultime8 sensation. Ultime8 joins the famous Shu Uemura Cleansing Oil family – and has already won accolades from 49 Asian women – with more joining their fold to give glowing testimonies to visibly improved skin after their first use of Ultime8. The secret behind Ultime8 lies in its ingredients which contain 8 carefully selected botanical oils – olive, jojoba, ginger root, corn, soy bean, shea butter, safflower and camellia. Ultime8 Complex is infused with a cashmere texture and delicately lifts the toughest makeup and impurities off your skin while the premier botanical oils penetrate deep into the skin layers to awaken and revitalise skin cells giving you the perfect canvas. Jojoba oil – contains Omega 3 to activate collagen synthesis and skin hydration. Jojoba helps to renew skin, leaving it supple and moisturized. Olive oil – widely used as a natural anti-ageing emollient leaving skin soft and moisturized. Ginger root oil – medicinal oil to fight skin damage and reduce inflammatory and oxidative reactions. Skin is brightened, soothed and protected. Soy bean – known to improve blood circulation and protect skin from oxidation. It restores luster and glow to skin while healing damage caused by sun exposure. Shea butter oil – rich in triglycerides and fatty acids Omega 6 and 9, it prevents the skin from sun damage, protecting skin from external stress. Safflower oil – extracted from safflower seeds. It reduces the visibility of wrinkles, eczema and redness in skin. It also regenerates skin. Camellia – extracted from the flowering Camellia growing in Japan, this is the secret of Japanese skincare. Known for its restorative and rejuvenating properties to nourish skin. Corn oil – contains various fatty acids as emollients providing an ultra-thin oil layer on the skin surface to protect dryness. Corn oil also hydrates and soothes dry skin. The secret to beautiful skin starts with gentle, thorough cleansing that removes impurities while protecting skin’s delicate moisture balance. Ultime8 Cleansing Oil is scientifically proven to improve moisture levels in the skin by 16.8%. 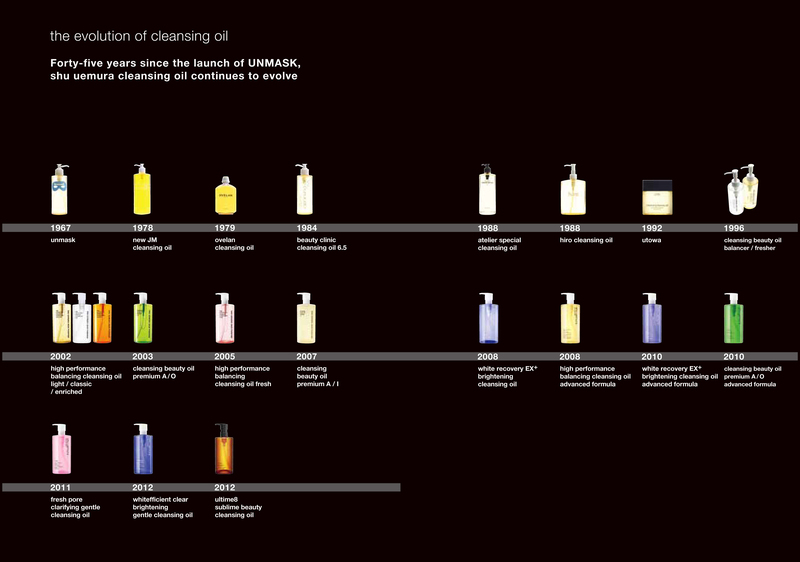 For more than a decade, the Shu Uemura research center searched for a golden combination of ingredients from several tens of thousands of oils. The goal – a fine and light texture that doesn’t compromise powerful cleansing ability and skincare benefits. With an incredible richness and smoothness that is light on skin, this inimitable and exclusive texture provides beautiful comfort that wraps your skin with pleasure and joy. Ultime8 is designed with a unique cleansing oil mechanism making it more powerful than conventional cleansing oils. Upon application, the water in oil (W/O) formula spreads onto skin with high affinity to remove impurities such as makeup and sebum and dissolves and disperses makeup residue in the lipid phase. With plenty of water, the structure is reversed, signaled by the milky emulsion, for easy rinsing and high removability. With advanced technology, this new formula can hold more water without compromising on texture and removability, allowing for ideals use – in the bath or in the spa even; ideal for travel, for the cleansing oil lover. Like a veil, skin is enwrapped in a luxurious fragrance that is unsurpassed while stubborn impurities are simply washed away. Ultime8 is designed with 8 herbal floral notes to awaken your senses. The beauty of cleansing oil is that it is the most effective to remove all impurities and it creates the best skin condition. Artful expressions of his unbridled, unconventional creativity – Mr Shu Uemura’s products mirror the man himself. Poetic, dashingly deft, groundbreaking and legendary, they have played a pivotal role in the modernization and maturation of our rituals of beauty. Created in 1967 while working as a cinema makeup artist for Hollywood, Mr Shu Uemura encountered a revolutionary oil-based cleanser. His first product, Unmask, was the only product at the time effective and sensitive enough ti purify, hydrate and protect the skin of 1960s cinema starlets. Delivering a high cleansing experience while remaining gentle to the skin, Shu Uemura cleansing oils respect skin’s natural moisture balance. Improve your skin condition every time you cleanse with specially selected oils and actives plucked from nature and fused with the intelligence of science. This unique balance is what has made Shu Uemura a respected name in beauty worldwide and a recognized pioneer of cleansing oils. 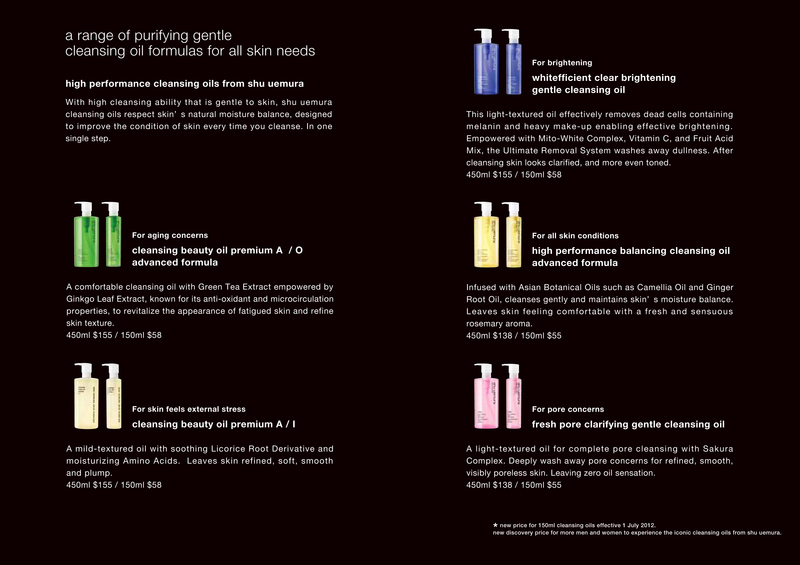 The NEW Shu Uemura Ultime8 Cleansing Oil is available island-wide from July 2012. Retails at S$65 for 150ml and S$170 for 450ml. I have tried a number of Shu Uemure Cleansing Oils and while they performed very well, my skin felt slightly irritated afterwords. Don’t know if it would be the Ginger Root extract or what. I have also noticed this slight amount of irritation with other brands of cleansing oil. The only one that is safe and very effective for my super sensitive skin is a cleansing oil made by a company called Tatcha. You can find them online. All their products are excellent! Very pure ingredients, not chemicals, are used such as camelia oil, green tea, rice bran and red algae. Tatcha makes a wonderful cleansing powder that exfoliates not with grains but with fruit acids and comes in 3 strengths. It doesn’t overstrip no matter how long I take to cleanse my face. They also have a gentle but effective treatment for brown spots that brightens my skin without burning it. Their moisturizer is wonderfully hydrating and feels very clean and pure. Lastly, they make two different blotting papers but what I like about them is that they do not contain powder which just gunks up my makeup and coats and dries my face. Tatcha blotting papers do not disturb or remove your makeup so no re-application necessary. I hope this company makes an eye cream soon and anything else they can think of because the entire line has worked for my dry sensitive skin and feels so non-chemical. You may want to take a look at their site! Shu’s the best when it comes to cleansing oil; I am currently using the Whitefficient and loving it. Looks like I am gonna get my hands on this Ultime8. DFS is selling this the 450ml at $136.